I have to confess my kids and I rarely stay on with a devotional or children's bible all the way to the end. Lately I've been trying to build my collection of stand-alone bible stories. 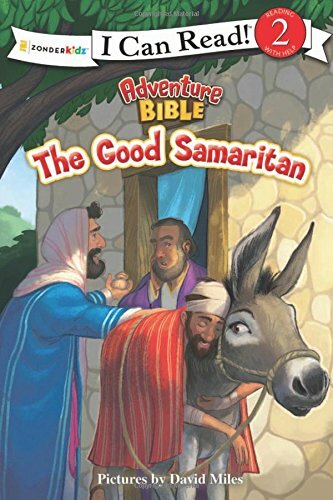 I've also got a first-grader learning to read, so Zonderkids' I Can Read book, Adventure Bible The Good Samaritan seemed like a good fit-- plus, it's one of my favorite parables. With only a sentence or two on each of its 32 pages, this slim paperback Level 2 reader kept my three sons' attentions. I liked that this version puts the familiar story into context as a parable Jesus told in response to a question about obtaining eternal life. I also liked that the text and illustrations of the priest and the Levite didn't portray them as "bad guys" but rather as people making the wrong choice because of fear and anxiety. This choice leaves the characters open for discussion. My son wanted to know, "Why did they just leave him there?" The book also ends with a simple description of the relationship between Jews and Samaritans, "In Bible times, the Jews and Samaritans did not get along. They were foreigners and did not know a lot about each other" (32). I felt this provided another jumping off point for relevant discussion. While I thought this easy reader was very nicely done, I asked my oldest what he thought of the book and has response was "Just OK." I think this was owing to the fact that his brain was completely filled with his current obsession over Lego Minecraft.... sigh! 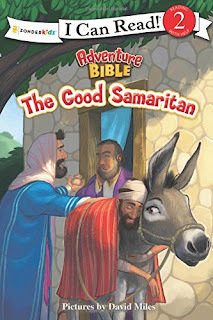 Though this is part of the Adventure Bible series, it is a quiet story meant for reflection. I plan to pull it out again when Oldest Son is in a quieter mood.